There’s a lot of missing information on this rum, specifically from where in Jamaica, and when it was made. Until I can get more, we’ll have to just take the tasting notes as they come, unfortunately, since that’s all I have. Nose – “Subdued” is the best word I can think of; there is very little of the fierce funkiness or hogo-infused Jamaican badass we’ve gotten used to with more recent Hampdens or Worthy Park rums. It’s slightly sweet, with caramel and citrus and vanilla, and the question one is left asking is “Where did the funk disappear to?” Leaving it to open and then coming back to it does not improve or enhance the aromas much, though some fruits and additional lemon peel, coffee grounds and bananas to become more noticeable. Palate – Ah well, here we go, the sharper funky stuff comes on stage at last. Still rather restrained, however. The rum presents as medium bodied, creamy, and tastes of caramel, vanilla, molasses, with a vibrant backbone of cherries, orange peel, ginger, grass, nutmeg and cinnamon. It really reminds me more of a Demerara (sans anise) than a true Jamaican, and in the absence of real details on the estate of origin, it’s remains something of a let down for those in love with the fierce ester-driven purity of more recent vintages. Thoughts – Not one of my favourites, to be honest. It’s too indeterminate and doesn’t carry the flag of Jamaica particularly well. I’m unsure, but (a) I think it’s been continentally aged and (b) it’s possible that the barrel was either charred was nearly dead. Were you to rate it as just a rum without reference to the island of origin, then it’s pretty good — but when I see Jamaica on a label, there’s certain things I look for, and even at nearly three decades old, there’s not enough here to mark it out as something special from there. There are no details on the estate of origin nor the year of distillation to be found. My personal opinion is that the rum is a column still rum, continentally aged and perhaps from Longpond (assuming it’s not a blend of some kind). Tracing Milroy’s is an odd experience. The bottom of the label provides an address which when searched for puts you in a quiet residential side street in Saxmundham (Suffolk), and when I called the phone number, the gent told me it had not been in the name of Mr. Milroy for over four years. Yet I found a reference that notes Milroy’s is a very well known spirits establishment in #3 Greek Street London. That one makes more sense (the Suffolk address was likely a personal one). According to K&L Wines, John “Jack” Milroy opened a wine shop in the West End in 1964 with funds provided by his brother (a gold miner from South Africa) and indulged in the bottlings of single cask Scotches. It’s reasonable to suppose an occasional rum flitted through their inventory over the years. The brothers sold the company (date unknown, likely late 1990s) which was run by La Reserve under the stewardship of Mark Reynier who later went on to fame as the man behind Bruichladdich, Murray McDavid and Renegade Rums. As of 2014, the company is once again an independent shop “Milroy’s of Soho” whose site I used for some of these historical notes. I’m guessing this is a Jamaican rum blend? 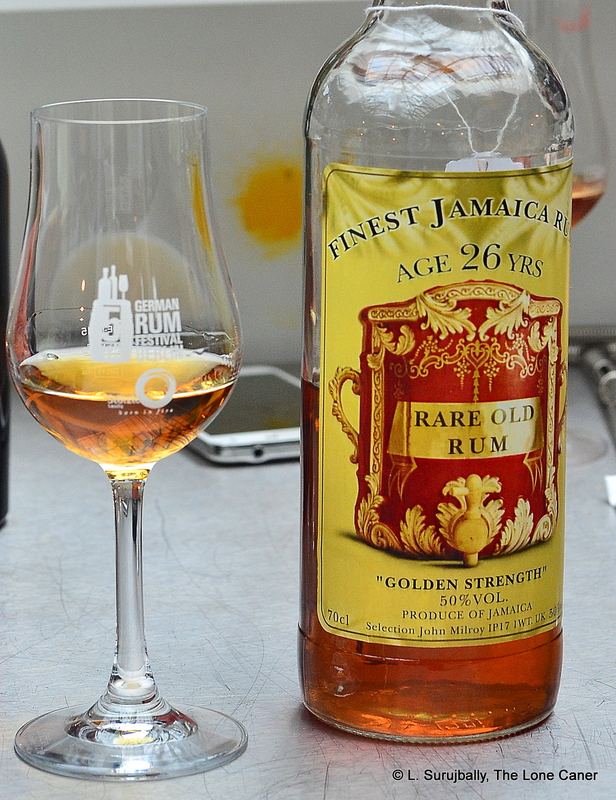 Isn’t it normal for older Jamaican rum funk to fade the older it gets? Or does it seem like the cask is rather fresher? I honestly don’t know, John. It’s possible that it’s a blend. I’m trying to contact Milroy’s, see if they can give details. As for funk fading, no, I don’t believe so.